KIEV, Ukraine -- Ukraine's Constitutional Court ruled on Thursday that a coalition supporting newly-elected President Viktor Yanukovich in parliament had been formed legally. Yanukovich, who took power in late February, had warned that he would call a snap parliamentary election if the court had found the coalition was formed illegally. An early election would have led to intense political campaigning, pushing back government action on reform, and the ruling, though widely expected, seemed certain to bring relief to potential investors in the ex-Soviet republic. The next scheduled parliamentary election is set for autumn 2012. After Yanukovich's inauguration on Feb. 25, his supporters introduced an amendment to parliament rules that allowed the quick formation of a coalition for a government under his political ally, Mykola Azarov. The amendment allowed individuals to defect from other factions, including the opposition, giving the Yanukovich camp a ruling majority of 235 deputies. But this was challenged as illegal under the constitution by the opposition grouped around Yanukovich's rival, former prime minister Yulia Tymoshenko. 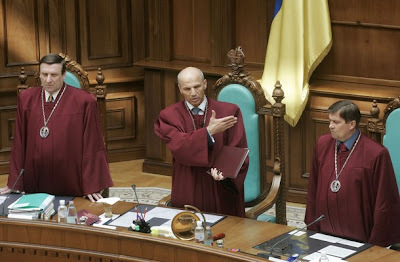 "Individual people's deputies ... have the right to take part in the formation of a coalition of factions in the Ukraine Parliament," the ruling, read out by court judge Andriy Stryzhak, said.